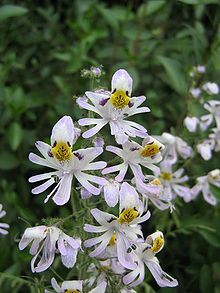 Schizanthus (butterfly flower) is a genus of flowering plants in the nightshade family Solanaceae. The genus is made up of twelve species: Schizanthus alpestris, Schizanthus candidus, Schizanthus grahamii, Schizanthus hookerii, Schizanthus integrifolius, Schizanthus lacteus, Schizanthus laetus, Schizanthus litoralis, Schizanthus parvulus, Schizanthus pinnatus, Schizanthus porrigens and Schizanthus tricolor. ↑ American Journal of Botany (1 July 2006). "Ancestral reconstruction of flower morphology and pollination systems in Schizanthus (Solanaceae)". Reproductive Biology. Botanical Society of America, Inc. Retrieved 14 February 2012.